If you lost a few or all of your teeth missing, Dentures is one of the best solutions to get back to your daily routine. A denture is made up from hard-wearing material that mimics the look of teeth and gums to give your mouth a natural appearance. Dentures are very popular when wearing them your won’t realize you that your teeth are actually missing and you’ll be comfortable with eating and chewing without any issues. At our clinic, with technological advancements, our dentures can look very natural and can be individually customized to give you the exact appearance you are looking for. Without skilled dental technicians working alongside the dentist and ensure to make the best fitted dentures, which can be fitted properly. Partial dentures can be made with a conventional metal framework, Valplast® plastic, or a combination. Partial dentures made with Valplast are the most aesthetic option. They feature high-quality replacement teeth and natural-looking cosmetic clasps, plus are thin, lightweight and flexible. Transitional dentures are dentures which are designed to transition a patient from one oral condition into the next. 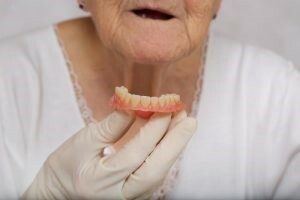 Transitional dentures are known as a temporary solution that will ultimately be replaced and discarded. These relatively inexpensive removable plastic dentures serve as a temporary tooth replacement and space maintainer while you wait for your mouth to heal enough for a dental implant. Once the healing process is complete, the dental implant can be placed. Full or partial dentures consist of a gum-colored base, which is usually made of plastic resin that fits over the remaining bone to hold the teeth. Removable dentures are actually held in place so that the suctioning effect can be obtained. Coming to the upper denture, it is benefited with extra support from the large surface area of the roof of the mouth. They both are important as this allows the denture to be stable and intact. Removable dentures also enable the patients to maintain more youthful facial features as it usually provides support to the facial bone and the soft tissues of the cheeks and lips. Denture relining is an affordable and straightforward solution to reshaping the denture’s underside to promote comfort as it rests against the gums. They can be either soft or hard, which completely depends on a person’s choice and condition. A soft denture reline is the most comfortable option and best for those who have sensitive gum tissues that can’t handle the weight of the denture. A soft reline takes place by our professionals by layering a liquid polymer right into the denture to provide cushion and depth, this is the fastest procedure that allows patients a perfectly comfortable fit.